We’ve all watched in awe as natural disasters strike with increasing frequency and violence. Blizzards, hurricanes, floods, lightning, tornado outbreaks, wildfires, and earthquakes dominate the news. Property damages often run into billions of dollars. Homes, and buildings for agriculture, commercial enterprises, and industrial businesses, must be ready to face the increasing risks. RHINO prefabricated metal buildings stand ready to meet the challenges. Building codes were created with a noble ambition— to prevent death, injury, and major property damage caused by inferior construction. Until a few years ago, there were three different building codes across the U.S.— the National Building Code (NBC), the Standard Building Code (SBC), and the Uniform Building Code (UBC). In 1994, the nonprofit, nongovernmental International Code Council (ICC) formed to propose an International Building Code (IBC) to strengthen and simplify the building design process. States and municipalities generally adopt the IBC suggested for their area, but may also amend it for their region. They have to weigh the likelihood of natural disasters for a given area against building costs, balancing safety and affordability. However, the rules of the game inevitably toughen after multi-billion dollar disasters like Hurricane Andrew, Hurricane Katrina, and Superstorm Sandy. Engineers once designed structures to survive a “hundred-year storm.” Extreme weather patterns over the past three decades make that benchmark inadequate. Across the country, building codes are slowly but surely changing to reflect the need for stronger structures in new construction. The insurance industry drives most steel building codes and their modifications. It is about the bottom line. As more major disasters occur, insurance companies find themselves paying out more and more in claims. 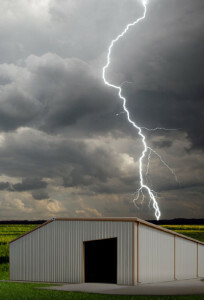 Stronger pre-engineered metal buildings mean less outflow of capital for them. Many insurance companies offer lower premiums for better-built pre-engineered metal buildings that follow steel building codes. Some now refuse to insure homes and business in high-risk locations. RHINO prefabricated steel buildings are designed and manufactured to meet or exceed any and all local building codes for the lifetime of the structure. We ship anywhere in the U.S., Canada, and Mexico. RHINO has never been refused a building permit for our strong, durable, prefab metal buildings. Call RHINO at 940.383.9566 to find out more about the strongest, safest, smartest steel buildings and for more information on pre-engineered metal buildings and steel building codes. Share the post "Building Codes and Pre-engineered Metal Buildings"